I think what touched me most was when Londo put his arm on G'Kar's shoulder and lingered like that for a few precious moments. That hit me for six emotionally. I can't take that scene seriously at all. The close-ups at that point, the deep emotion on Londo's face, G'Kar's pouting in return, the crescendo in the music, always makes me think they're about to fall into each other's arms and start kissing.. I found that scene believable; under normal circumstances, I would agree that Londo showed a rather high level of emotion. However, he knew that he was taking his last actions as a free man. As Londo himself said, he had all the power he could ever want but no choices at all. I agree. I found that scene quite believable and perfectly understandable considering the circumstances. A. Absolutely wonderful episode. Very very heavy, the horrible tragedy of Londo pays off after 5 seasons of setup. Best ep of S5 by a mile. I think it's also the first time I've seen "a fate worse than death" played out and been convinced by it. Wow, what a payoff!! This is B5 arc storytelling at its very best. Nothing is ever isolated, and this war is not new, just a continuation - or an echo - of the Shadow War. The Drakh's statement, that they are "a shadow of a shadow", is fascinating. They have chosen a horrible revenge, and for all we thought that the war of the First Ones was past, we see that "it ain't over till it's over". Alas, there's no fat lady singing to put a final end to it all. For all his silliness, the Regent has a certain kind of dignity when his end comes. And Londo shows a fatalistic dignity when accepting what he has to do to save his people. Londo's farewell to G'Kar really is touching - we see him genuinely experiencing and displaying emotion, for the last time. His look back at a time with "no power and all choices", compared to "all power and no choice" now, is chilling. I found G'Kar's acknowledgement of their friendship in forgiving him as an individual very touching, as was Londo's rescue of him before that. It's also interesting to see Londo trying to protect his friends, including Vir. He can't explain to any of them and must allow them to misjudge him without correcting their opinions. And he looks *so* unhappy that no one could help feeling sorry for him. Delenn sees the darkness surrounding him, and he is now completely alone. What a horrible feeling! Delenn and Lennier's rescue is suspenseful to the very end. And his admission of his love for her in the face of death changes nothing - she already knows that, and gracefully provides him with a way to keep his face. The drastic measures of reparation and punishment remind me of post-WW I and II actions of the Allies against the Germans, who started the wars. One statement continues to apply: War advances technology - the destructive kind. That's a rather depressing conclusion. Well I'm really glad my DVD is apparently only broken on the first episode on this disk, so I was able to watch this without major issues. This is a REALLY great episode. I tend to feel a bit "meh" about season 5 (only in comparison with the great stuff in seasons 3 and 4), but then I watch it and I'm reminded again that there is some excellent stuff in there, too. I don't find that scene where G'Kar forgives Londo cheesy,and I sometimes think I have a hair trigger reaction to "cheesy". I find it quite moving. Maybe if I saw it by itself, without context ... But knowing all the back story on the Londo - G'Kar relationship, it's a very important scene. I guess that goes for the whole episode. 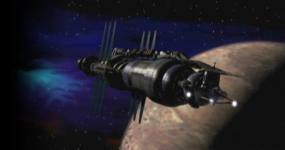 It builds on EVERYTHING that comes before, which is what makes Babylon 5 so excellent. I'm just saying stuff that everyone's already said, so I'll leave it there... except a comment about how Dr. Franklin's little speech about Soviet Union weapons sounds a little weird now, to 2015 ears. Just watched this one for the first time. Great episode i'm like holy crap they are bout to light Centauri Prime up like a Christmas Tree! I agree that despite the regent being a bit goofy and grating his end, I did feel bad for him. And poor Londo realizing that he is really just screwed in the end with no way out but to do what he needs to or lose his people/homeworld. And Lennier, saying I love you to Delenn. I felt that her saying she didn't hear was wrong. She knew I think she knew for a while, she could acknowledge that she knows, no need to deny it happened. Who would ask? Emporer Mollari II, wow! Interesting to see where it goes i'm guessing it ties into World Without End, with imprisoned Sheridan?